Free Choice: Camp-Code for, "The Boys Decide"
Remember the days when your son flatout refused to get dressed for pre-school? Fortunately, you were bigger and stronger, so you could wrestle him into an outfit and get him to school, pretty much on time. Try as you might, it was difficult to disguise how frazzled you were when you pulled into the parking lot 15 minutes late. Thank heavens for the calm, wise teachers back then, who advised, “It’s important to give your son some choices. Let him feel he has some control over his life — within limits, of course.” Needless to say, they didn’t mean, “Son, would you rather get dressed and go to pre-school or stay in your pajamas and watch TV all day?” The more appropriate choice might have been, “Son, do you want to wear your bulldozer T-shirt or your Panthers’ jersey today?” The latter was a simple, age-appropriate choice, with no right or wrong answer. The pre-school teachers were indeed onto something. The ability to make wise, heartfelt choices is a vital characteristic of independent, successful teens and adults. Indeed, experts say that allowing children to make their own decisions can increase their confidence, feeling of importance, and personal delight. Child development experts say that teaching young people good decision-making skills is one of the most powerful ways to teach them responsibility and self-discovery, and to encourage them to be successful, happy, contributing members of society. What does making wise choices have to do with camp? 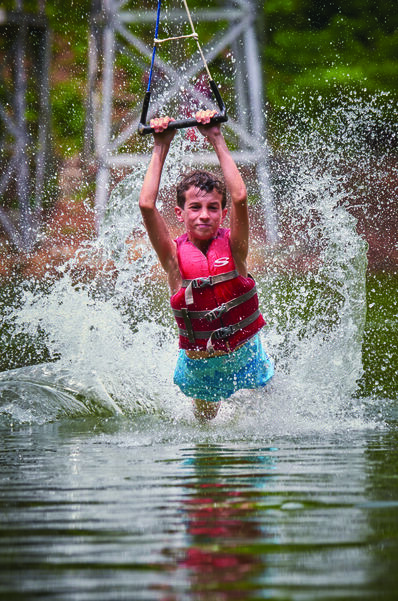 At Falling Creek, we have deliberately structured our activity schedule to provide our campers with numerous opportunities to practice making sensible, independent decisions that have no right or wrong answer. On Opening Day, campers begin to flex their “choice making muscles” when they design a schedule that is tailor-made to suit their personal interests. Each day consists of six “structured” activity periods, so each camper chooses his six favorite activities. With 28 activities on the roster, there are more than enough options to excite boys of all ages. There are also two “free choice” periods each day, one before lunch and one before dinner. 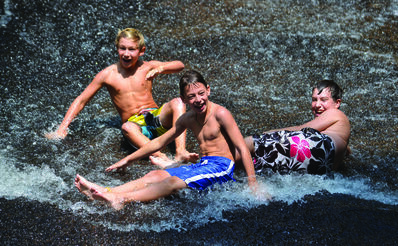 Free choice activities give campers an opportunity for free time. Boys might choose to hang out at the waterfront, catapulting their friends off the blob, zooming down the roller coaster, plummeting from the rope swing, or doing cannon balls off the diving board. Other free choice options include working out at Frank’s Fitness or getting involved in pick-up games of basketball, tennis, Ping-Pong, or indoor soccer. Some boys choose to play in the creeks, making dams. If a camper would like a slower pace, he can sit and play chess with a friend or simply read a good book. Regardless of personal preference, they all show up happy and hungry when the bell rings for meal times. At Falling Creek, we respect each camper enough to allow him to be the “expert” for the summer. Your son will have the freedom to go with his gut and choose the combination of activities that feels right to him. That might mean choosing kayaking, rock climbing or riflery, which he can’t do back home, or it might mean pursuing his “main sport” as much as he possibly can so he’s a step ahead when he returns home. Boys often choose activities to be with their friends, or because the counselor teaching it makes it so much fun. He might want to try an activity that is brand new for him, because he knows camp is the perfect place to experiment and learn. There are truly no right or wrong decisions when it comes to choosing activities at camp. What is certain is that your son will have to make some tough choices. 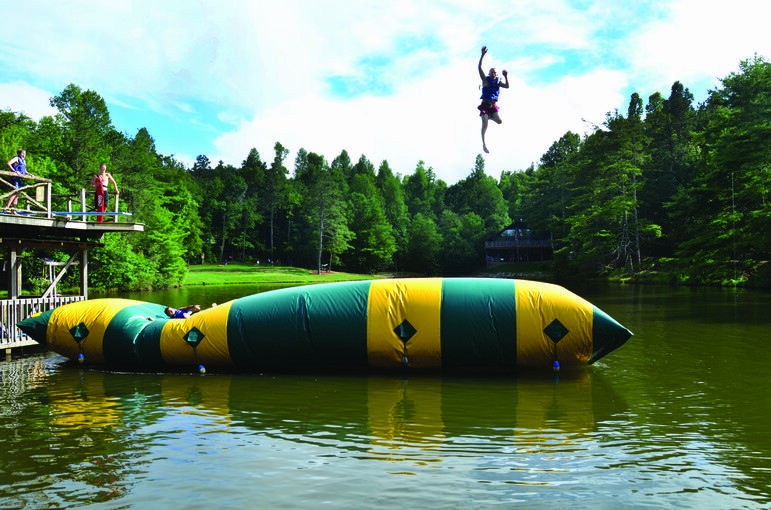 A camper can’t possibly participate in all 28 activities during a single summer. But isn’t that the way life goes? Boys are forced to prioritize, and what better place to practice doing so than at camp, where there are no negative consequences? After lunch on Opening Day, our counselors put on hilarious skits to introduce themselves to the campers and to sell “their” activities. It’s Marketing 101, camp-style. 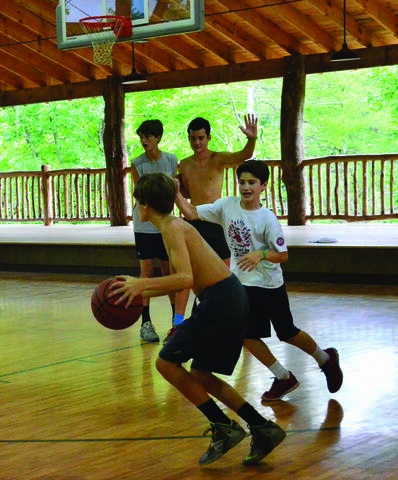 After activity skits, the boys head up to the gym with their cabin counselors to sign up for their ideal schedules. Tables are set up for each activity in case the boys have questions. Cabin counselors make sure the process runs smoothly. 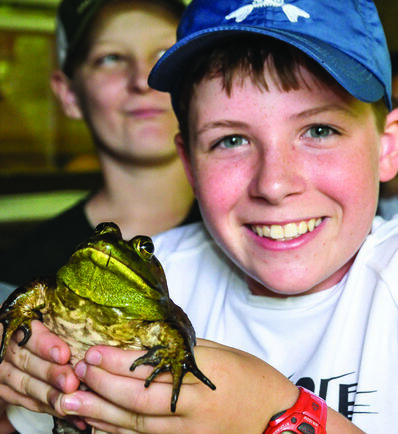 Once each camper has chosen his schedule, he then gets to choose from a wide variety of out-of-camp adventures. It is not uncommon for 10 trips out of camp most days. Your son might choose a mountain biking trip in Dupont State Forest or Tsali, or a paddling trip on the Tuckaseegee River or the Nantahala. 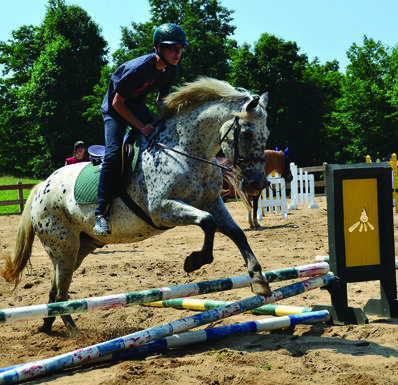 Or he might pick a trip to Sliding Rock or a trail ride on his favorite horse. On average, we have over 100 boys each day mountain biking, backpacking, paddling, sailing, and rock climbing in the mountains of western North Carolina during June Session (3 weeks) and Main Camp (4 weeks). Parents sometimes ask, “Why isn’t my son choosing to do something other than what he initially signed up for?” Or, “Why is he not taking advantage of the trips and special sign-ups?” The boys are coached and encouraged regularly to sign up for the specific activities they want. Our counselors suggest activity options as a part of their normal discussions, especially during Evening Embers. Cabin counselors check in with the boys, and follow a series of specific prompts we require them to ask about activities when they meet with their campers individually each week. Trying new activities is also often a theme or topic during Morning Watch, Church, Campfire, and Morning Assembly. We make sure the boys know about all the opportunities for activities, special sign ups, and adventure trips. We make ourselves available after morning announcements and encourage them to ask any questions they may have. You would think most boys would want to take immediate advantage of special sign-up activities, especially the outdoor-related ones. But many times the boys just want to stick with the in-camp activities they enjoy so much, even with all the prompting and encouragement they receive from counselors. With “sign ups” out of the way, it’s time for the fun to begin. Activities commence immediately on the first full day of camp, which means your son has yet another decision to make: how seriously will he pursue his activities? It is totally up to him. Some boys arrive at Falling Creek sick to death of being graded by teachers and evaluated by coaches. All they want to do is “chill.” They would rather focus on the fun, which is fine with us. Other boys want to participate in as many unique activities as they can while they are here, mastering new skills along the way. We love that, too. That’s why we have implemented a camp-wide progression system that gives campers the opportunity to build confidence as they advance through five levels within each activity: Level 1 – Scout; Level 2 – Explorer; Level 3 – Challenger; Level 4 – Ranger; and Level 5 – Warrior. 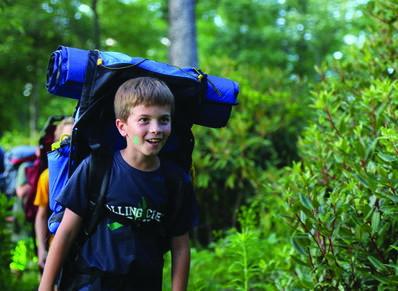 Each level has a set of criteria a camper must complete in order to advance. The level system is similar to the Boy Scouts’ rank program. Progressing from one level to the next is based on a camper’s effort, and includes leadership and service components. Some levels can be achieved in a few days, while others take several summers. Campers who reach the Ranger and Warrior levels are recognized permanently on the Hall of Fame Board on the side porch of the dining hall. This is camp, so flexibility is in our DNA. We mention that because, as interests are discovered or developed, campers change their minds. When the boys want to tweak their schedules, they can do so each Sunday when they also sign up for new out-of-camp adventures. As you can see, we give the boys a great deal of freedom so they can follow their hearts and begin to experience making their own choices. Choice extends to other things — if you choose not to hang up your wet bathing suit to dry, you will have a cold, wet bathing suit the next time you need it. This is a natural consequence, but one without harsh or long-term, negative outcomes. We believe it is never too early to practice making smart decisions, especially in an adult-supervised environment like Falling Creek Camp. As author and speaker Anthony Robbins puts it, “Our lives are shaped by the choices we make. Success and failure are not overnight experiences. It’s the small decisions along the way that cause people to fail or succeed.” We see successful young men all around us! 828-692-0262 Blog › Free Choice: Camp-Code for, "The Boys Decide"